I presented our recent work on the electronic spectroscopy of tantalum hydride (TaH) at the 25th International Conference on High Resolution Molecular Spectroscopy at Bilbao, Spain. My co-authors were Sam Gleason (‘19), Paul Reischmann (‘19) and Dalir Kellett (‘20). Bilbao is a beautiful, revitalized Basque city in northern Spain. A highlight of the conference was an address given by Prof. Dudley Hirschbach at Frank Gehry’s iconic Guggenheim Museum. Our second paper on gold sulfide (AuS) has just been published, by the journal Molecular Physics, as part of a special issue from the HRMS Conference I presented at last August in Helsinki, Finland. We report on a high-resolution analysis of the a⁴Σ⁻₃⸝₂–X²Π₃⸝₂ system in the near-infrared. It is the first spin-forbidden transition we have ever studied. The transition intensity is provided by the strong spin–orbit coupling of the heavy gold atom. My co-authors are Austin Parsons (now earning his Ph.D. in Bob Continetti's research group at UC–San Diego) and Sam Gleason, who is a Macalester senior. On November 3, 2017, I had the privilege of presenting the Janet Andersen Award Lecture for the Midstates Consortium for Math and Science. What made the event extra special for me was the opportunity to deliver the talk at the University of Chicago, one of the world's great research universities and the former academic home of Prof. Robert Mulliken. He was one of the great molecular spectroscopists, co-developer of molecular orbital theory, and a Nobel laureate in chemistry. I have been teaching Physical and General Chemistry at Macalester College since 1993. My research is focused on the electronic spectroscopy of metal-containing free radicals in the gas phase, particularly their fine and hyperfine structures. We utilize pulsed and continuous-wave lasers (both dye and Ti:sapphire), often working at very high resolution. We seek to unravel and assign the complicated spectra of these open-shell free radicals, thus deciphering their Hamiltonians and illuminating their electronic structure. Some of these molecules are of astronomical interest, as this image of the Orion Molecular Cloud Complex suggests. I received my B.A. degree in chemistry in 1985 from Hamline University and my Ph.D. degree in physical chemistry from MIT in 1990. I was a postdoctoral scholar at the National Institute of Standards and Technology from 1990–92 and a NATO Postdoctoral Fellow at the University of Oxford from 1992–93. In this training, I explored the spectroscopy of free radicals using a variety of experimental techniques and wavelengths (microwave, far-infrared and visible). I have had four sabbatical leaves from Macalester College, taken in (1) Boulder, Colorado, (2) Vancouver, British Columbia, (3) Sydney, Australia, and (4) Zürich, Switzerland & Florence, Italy, as well as two research summers spent at the University of Oxford, England. I take as my professional motto the sentiment expressed by the 19th-century French chemist and statesman Jean-Baptiste Dumas, who once wrote that “the greatest joy of my life has been to accomplish original scientific work, and next to that, to lecture to a group of intelligent students.“ I feel fortunate to be able to do the same here at Macalester College. We have been working for two summers on the electronic spectroscopy of tantalum hydride (TaH). My collaborators on this project are Sam Gleason, Paul Reischmann and Dalir Kellett. The figure shows all of the electronic states we have identified, including six low-lying states within 0.5 eV of each other, as determined by a combination of laser excitation and dispersed fluorescence experiments. The ground state of the molecule is X3Φ2, with an Ω = 0+ state located only 76 cm–1 higher in energy. Our most recent molecule of interest is gold sulfide, AuS. The gold–sulfur bond is of fundamental interest in the nanoelectronics and molecular self-assembly communities. We have analyzed transitions from the ²Π ground state to three excited doublet states and a low-lying quartet state, all at hyperfine resolution. This work has been carried out by several students, including most recently Sam Gleason and Austin Parsons. We are also collaborating with Tim Steimle's group at ASU on this work. We have recently developed new laboratory exercises for the undergraduate physical chemistry lab, now published as three different articles in the Journal of Chemical Education. These experiments involve powder x-ray diffractometry, acoustic interferometry with an Apple iPad, and gas compressibilities. Student collaborators include Andrew Bendelsmith, Kacper Skakuj, Brad Pearlman, Ian Wyse, Sam Gleason and Dalir Kellett, as well as my colleagues Keith Kuwata and Ken Moffett. Tantalum oxide has been a favorite molecule of ours. We have published two studies of the molecule, with a particular focus on the hyperfine structure of the ground and several excited states. Macalester students Kara Manke, Tyson Vervoort, Casey Christopher, Stephanie Lee, Francis Gwandu, Andrew Matsumoto, Ben Knurr, Tom Mahle and Zachary Morrow have all worked on this interesting molecule. Our interest in gold chemistry and spectroscopy first began by recording unbelievably strong spectra of gold fluoride in the visible region, made from the reaction of sputtered gold with sulfur hexafluoride. We resolved and analyzed hyperfine splittings from both the Au and F nuclei. This work was carried out by Ben Knurr, Elissa Butler, Kara Manke and Tyson Vervoort. Macalester student Andrew Bendelsmith and I analyzed two electronic bands of tantalum sulfide (TaS) at high resolution in order to understand the hyperfine structure of the molecule. As you can see in these sub-Doppler spectra, the spin of the Ta nucleus is 7/2. My colleague and collaborator Keith Kuwata used density functional theory to obtain calculated values of the magnetic hyperfine parameters that are in excellent agreement with our experimental results. We published our results in the Journal of Molecular Spectroscopy. Tantalum hydride (TaH) has proven to be a challenging molecule. We have observed many different electronic states in the DCM dye region alone. So far we have published one paper—with student collaborators Casey Christopher and Stephanie Lee—that focused on the hyperfine structure of one of the strongest bands we observed. Our analysis of this structure showed that the ground state is well described as a σ2πδ, 3Φ2 state, in agreement with recent computational results on the molecule. The Varberg research group is grateful to the following funding agencies for support of the work in our lab. 36. A. J. Parsons*, S. P. Gleason* and T. D. Varberg, “High resolution spectroscopy of the a⁴Σ⁻₃⸝₂–X₁²Π₃⸝₂ system of gold monosulphide in the near infrared,” Molecular Physics, 2018, (published online 08 April 2018). 35. T. D. Varberg, B. W. Pearlman*, I. A. Wyse*, S. P. Gleason*, D. H. P. Kellett* and K. L. Moffett, “Determining the speed of sound and heat capacity ratios of gases by acoustic interferometry,” Journal of Chemical Education, 2017, 94, 1995–1998. 34. D. L. Kokkin, R. Zhang, T. C. Steimle, I. A. Wyse*, B. W. Pearlman* and T. D. Varberg, “Au–S bonding revealed from the characterization of diatomic gold sulfide, AuS,” Journal of Physical Chemistry A, 2015, 119, 11659–11667. 33. T. D. Varberg and K. Skakuj*, “X-ray diffraction of intermetallic compounds: A physical chemistry labor­atory experiment,” Journal of Chemical Education, 2015, 92, 1095–1097. 32. C. R. Christopher*, S. Y. Lee*, F. B. Gwandu*, A. J. Matsumoto*, B. J. Knurr*, T. K. Mahle*, Z. W. Morrow* and T. D. Varberg, “Rotational and hyperfine analysis of the E²Π₁⸝₂–X²Δ₃⸝₂ electronic transition of TaO,“ Journal of Molecular Spectroscopy, 2014, 301, 25–27. 31. S. Y. Lee*, C. R. Christopher*, K. J. Manke*, T. R. Vervoort* and T. D. Varberg, “The electronic spec­trum of tantalum hydride and deuteride,” Molecular Physics, 2014,112, 2424–2432. 30. T. C. Steimle, R. Zhang, C. Qin and T. D. Varberg, “Molecular-beam optical Stark and Zeeman study of the [17.8]0⁺–X¹Σ⁺ band system of AuF,“ Journal of Physical Chemistry A, 2013, 117, 11737–11744. 29. A. J. Bendelsmith*, K. T. Kuwata and T. D. Varberg, “Hyperfine structure in the electronic spectrum of TaS,” Journal of Molecular Spectroscopy, 2012, 276–277, 14–18. 28. T. D. Varberg, A. J. Bendelsmith* and K. T. Kuwata, “Measurement of the compressibility factor of gases: A physical chemistry laboratory experiment,” Journal of Chemical Education, 2011, 88, 1166–1169. 27. E. K. Butler*, B. J. Knurr*, K. J. Manke*, T. R. Vervoort* and T. D. Varberg, “Excited electronic states of AuF,” Journal of Physical Chemistry A, 2010, 114, 4831–4834. 26. B. J. Knurr*, E. K. Butler* and T. D. Varberg, “Electronic spectrum of AuF: Hyperfine structure of the [17.7]1 state,” Journal of Physical Chemistry A, 2009, 113, 13428–13435. 25. D. L. Kokkin, T. P. Troy, M. Nakajima, K. Nauta, T. D. Varberg, G. F. Metha, N. T. Lucas and T. W. Schmidt, “The optical spectrum of a large isolated polycyclic aromatic hydrocarbon: hexa-peri-hexabenzocoronene, C₄₂H₁₈,” Astrophysical Journal, 2008, 681, L49–L51. 24. K. J. Manke*, T. R. Vervoort*, K. T. Kuwata and T. D. Varberg, “Electronic spectrum of TaO and its hyperfine structure,” Journal of Chemical Physics, 2008, 128, 104302/1–6. 23. M. A. Roberts*, C. G. Alfonzo*, K. J. Manke*, W. M. Ames*, D. B. Ron* and T. D. Varberg, “Hyperfine structure in the electronic spectrum of ReO,” Molecular Physics, 2007, 105, 917–921. 22. P. J. Hodges, J. M. Brown and T. D. Varberg, “The ultraviolet spectrum of the CoCl₂ radical, studied at vibrational and rotational resolution,” Journal of Chemical Physics, 2006, 124, 204302/1–10. 21. A. Shayesteh, R. J. Le Roy, T. D. Varberg and P. F. Bernath, “Multi-isotopologue analyses of new vibration–rotation and pure rotation spectra of ZnH and CdH,” Journal of Molecular Spectroscopy, 2006, 237, 87–96. 20. T. D. Varberg and J. C. Roberts*, “The isotopic dependence of the spin–rotation interaction: The rotational spectrum of cadmium hydride in its X²Σ⁺ state,” Journal of Molecular Spectroscopy, 2004, 223, 1–8. 19. C. T. Kingston, A. J. Merer and T. D. Varberg, “The electronic spectrum of NiCN in the visible region,” Journal of Molecular Spectroscopy, 2002, 215, 106–127. 18. 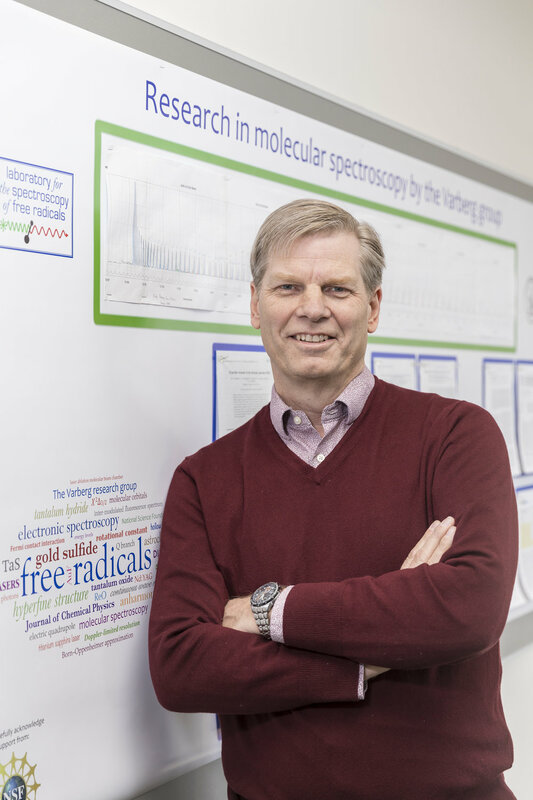 T. D. Varberg, F. Stroh and K. M. Evenson, “Far-infrared rotational and fine-structure transition frequencies and molecular constants of NO in the X²Π (v = 0) state,” Journal of Molecular Spectroscopy, 1999, 196, 5–13. 17. T. D. Varberg, J. C. Roberts*, K. A. Tuominen* and K. M. Evenson, “The far-infrared spectrum of deu­terium iodide,” Journal of Molecular Spectroscopy, 1998, 191, 384–386. 16. F. A. Tezcan*, T. D. Varberg, F. Stroh and K. M. Evenson, “Far-infrared rotational spectra of ZnH and ZnD in the X²Σ⁺ (v = 0) state,” Journal of Molecular Spectroscopy, 1997, 185, 290–295. 15. N. M. Lakin, T. D. Varberg and J. M. Brown, “The detection of lines in the microwave spectrum of indium hydroxide, InOH, and its isotopomers,” Journal of Molecular Spectroscopy, 1997, 183, 34–41. 14. M. Bellini, P. De Natale, M. Inguscio, T. D. Varberg and J. M. Brown, “Precise experimental test of models for the breakdown of the Born–Oppenheimer separation: The rotational spectra of isotopic variants of lithium hydride,” Physical Review A,1995, 52, 1954–1960. 13. R. J. Low, C. J. Whitham, T. D. Varberg and B. J. Howard, “The microwave spectrum of the open-shell complex Ar⋅NO₂,” Chemical Physics Letters, 1994, 222, 443–449. 12. J. M. Brown, T. D. Varberg, K. M. Evenson and A. L. Cooksy, “The fine-structure intervals of N⁺ by far-infrared laser magnetic resonance,” Astrophysical Journal, 1994, 428, L37–L40. 11. T. D. Varberg, K. M. Evenson and J. M. Brown, “Detection of OH⁺ in its a¹Δ state by far-infrared laser magnetic resonance,” Journal of Chemical Physics, 1994,100, 2487–2491. 10. T. D. Varberg and K. M. Evenson, “The pure rotational spectra of CuH and CuD in their ground states measured by tunable far-infrared spectroscopy,” Journal of Molecular Spectroscopy, 1994, 164, 531–535. 9. K. V. Chance, T. D. Varberg, K. Park and L. R. Zink, “The far-infrared spectrum of HI,” Journal of Molecular Spectroscopy, 1993, 162, 120–126. 8. R. J. Low, T. D. Varberg, J. P. Connelly, A. R. Auty, B. J. Howard and J. M. Brown, “The hyperfine structures of CuCl and CuBr in their ground states studied by microwave Fourier transform spectroscopy,” Journal of Molecular Spectroscopy, 1993, 161, 499–510. 7. T. D. Varberg and K. M. Evenson, “Laser spectroscopy of carbon monoxide: A frequency reference for the far-infrared,” IEEE Transactions on Instrumentation and Measurement, 1993, 42, 412–414. 6. T. D. Varberg and K. M. Evenson, “The rotational spectrum of OH in the v = 0–3 levels of its ground state,” Journal of Molecular Spectroscopy, 1993, 157, 55–67. 5. T. D. Varberg, J. A. Gray, R. W. Field and A. J. Merer, “Reanalysis and extension of the MnH A⁷Π–X⁷Σ⁺(0,0) band: Fine structure and hyperfine-induced rotational branches,” Journal of Molecular Spectroscopy, 1992, 156, 296–318. 4. T. D. Varberg and K. M. Evenson, “Accurate far-infrared rotational frequencies of carbon monoxide,” Astrophysical Journal, 1992, 385, 763–765. 3. T. D. Varberg, R. W. Field and A. J. Merer, “Elucidation of electronic structure by the analysis of hyper­fine interactions: The MnH A⁷Π–X⁷Σ⁺(0,0) band,” Journal of Chemical Physics, 1991, 95, 1563–1576. 2. T. D. Varberg, R. W. Field and A. J. Merer, “Hyperfine structure of the MnH X⁷Σ⁺state: A large gas-to-matrix shift in the Fermi contact interaction,” Journal of Chemical Physics, 1990, 92, 7123–7127. 1. T. D. Varberg, E. J. Hill and R. W. Field, “Laser spectroscopy of CoH: Spin–orbit splitting of the ground state,” Journal of Molecular Spectroscopy, 1989, 138, 630–637.